One of the many unfortunate misconceptions that exist about atheists is that, because we do not believe in a God, we are inherently disinterested in any stories or discussions about religion. This is, of course, untrue – I am fascinated by the tales and teachings of the major modern faiths, just as most people, religious or no, tend to be enraptured when hearing about ancient Greek, Roman, or Norse mythology. Whether or not one believes the stories to have actually, literally happened does not preclude one from finding or searching for meaning in them, or being interested in what these stories say about who we are (or were) as people. The stories we communally tell – especially those we pass down for hundreds and thousands of years, through countless generations all over the world – say a great deal about us, about our beliefs and patterns of thought. If a story, including one rooted in scripture, still holds mass sway in our world thousands of years after it was initially told, that is one worth exploring, worth taking seriously and picking apart, because for it to endure across the ages, it must touch upon something deeply rooted in the human condition, something that does not change with time, technology, language, or culture. For Darren Aronofsky, Noah is one such story, and the brilliance of his film lies in his ability to treat this tale as the myth it is, using it as a means to explore not only some of the biggest questions about who we are and what we are worth as human beings, but to illustrate perhaps the greatest and most central paradox of religion itself. Even if I had not known ahead of time, it would be obvious to me that this is a massively significant passion project for Aronofsky; every single idea in the film feels deeply and seriously considered, as if all of it has been rattling around in Aronofsky’s brain for decades, constantly cascading against each other, desperate to take form. It is clear that in the story of Noah’s Ark, Aronofsky sees something immensely provocative, something both massively disturbing and quietly uplifting, and I think the highest praise I can lend the film is that those many thoughts and feelings and emotions come through as one powerful and unified interpretation, one that absolutely floored me from start to finish. Perhaps the reason I connect so strongly with the film is that Aronofsky’s starting point seems to be the same question that ultimately drove me away from religion, and the one that has likely been most vexing to people of faith throughout the ages: If there is a God, and if he is loving, and if we were made in his image, why does he allow us to sin and to suffer without intervention? Why, if he exists, are we allowed to be confused, to be unsure of our role on this earth and the boundaries of what constitutes goodness, if there is a creator who holds all the answers? Religion is, for this very reason, a mess of contradictions, and Aronofsky seems to view the tale of Noah’s Ark as the white hot burning epicenter of these many paradoxes. It is a tale in which God decides that humanity, because of its sins, must be washed clean from the earth, and while that sounds simple enough as a basic myth, it immediately becomes more terrifying and complex once one starts digging deeper. Humanity, of course, is not one giant unified force – it is made up of multitudes, each individual multifaceted in their own ways, each person’s sins determined by more than simple calculations of good or evil, and each generation’s general character or circumstances shaped by those who came before. The biblical flood is an elegant solution insomuch as it wipes the problem entirely clean, but in doing so, does God address the actual root source of the problem, or does he simply punish and judge indiscriminately? In the end, is God himself the problem for not giving mankind clearer direction, for leaving us in the dark when we need guidance towards the light? 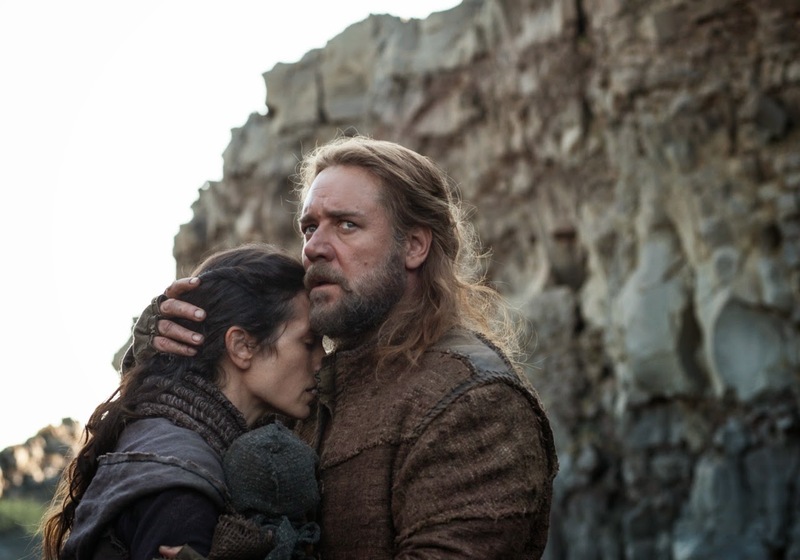 These issues are at the heart of Aronofsky’s Noah, and it is, as a result, an intensely, almost overwhelmingly dark experience. Aronofsky has cued in on a horror that is inherent in this story, but which I had never thought to consider until now. He treats the flood as the apocalypse that it is, forcing us to watch masses of people die and suffer without recourse or absolution, and he frames it all through the eyes of a man who has to bear the burden of his species’ near-extinction on his shoulders. What would it be like to live on the furthest edge of a post-lapsarian world? How dark and hopeless would that world be? How hard would it be to muster up hope for humanity on a good day, let alone after learning one’s creator intends to destroy the totality of his creation? What kind of crippling, crushing guilt and despair would God be instilling in this man by telling him humanity must be destroyed, while simultaneously making this man shepherd the innocent, non-human creatures through the apocalypse? How could one see light in this scenario? How could one stand to bear the weight of a species that has so utterly, thoroughly failed in the eyes of its creator? The film’s staggering sense of atmosphere is its greatest asset. Matthew Libatique’s haunting and evocative cinematography favors vast, open landscapes, infinite stretches of barren, desolate terrain in a post-industrial world, one which could exist in the distant past of biblical times, or in the far-off future, after our current societies have fallen. There are plenty of hints in the film that favor one interpretation or the other, but it doesn’t really matter – the point is that the time of Aronofsky’s Noah is a universal possibility for mankind, a direct result of our exploitation of the land and our belief that the earth and all its creatures exist in subservience to us. The melancholy of this landscape, which dwarfs our characters utterly, is matched by the quiet intensity of Clint Mansell’s gorgeous, sweeping score, underlining the sadness of a waning humanity and the fury of a vengeful God. The film’s characters are an obvious product of this oppressively bleak atmosphere. Noah and his family are devout, but not necessarily hopeful – they live for the sake of living, and it is only when Noah is contacted by God (through a series of terrifying dream sequences) that they seem to have any direction. The ‘antagonists’ of the film, such as they are, are not necessarily evil so much as bound by circumstance. Neither bad nor good, the people of this dying civilization do horrible things, but they do so struggling to survive in a broken, fallen world they themselves had no hand in creating. Which, of course, is one of the religious paradoxes the film explores. Generational succession is hugely important to the Bible, and it is something Aronofsky pays close attention to here, with Noah and his family being direct descendants of Seth, the ‘good’ surviving son of Adam and Eve, and the majority of civilization (the ‘fallen’ people) being descended from Cain, who killed his brother Adam. One of the most provocative issues in the film is how these people are judged – by both the creator and the harshness of the world in which they live – by decisions made long ago by their ancestors. Why should man be judged by such distant mistakes? Why should the descendants of Cain be trapped in a seemingly inescapable cycle of squalor and violence, and why should Noah, as a descendent of ‘goodness,’ have to bear the burden of watching this broken world be washed away? These questions are absolutely in the forefront of Aronofsky’s film, and they are fascinating to me. I suspect many viewers will be turned away by the sheer scale of the film’s second act, when the descendants of Cain swarm upon the ark in a last ditch effort to survive, but it feels completely organic to me. We have to see the human suffering to fully understand not only this situation, but Noah’s mindset, which grows increasingly dark and disturbed as the film heads towards the apocalypse. The erosion of humanity depicted here is neither simple nor easily digestible, and when the end comes, we have to see in full what that erosion has led to, what it means to a civilization to be utterly abandoned by their God, left to die in terrible circumstances. Some of the most powerful moments in the film come from the ‘antagonist,’ the self-declared King Tubal-cain, who begs God, on multiple occasions, to speak to him, who is confused and angry because he simply has no way to know what his God wants or what he should do. He has never been spoken to or given purpose the way Noah has; he, like the rest of humanity, feels rejected, left alone to struggle in a dying world with limited options, and when no help from the heavens comes, he figures he must make for himself, whatever the cost. And who, honestly, can blame him? It is easy to quote scripture and talk about God’s ideal for humanity, but when the chips actually fall, and man is forced to live in accordance with these rules, and sees firsthand how little these rules help him navigate an impossible situation, what good does that scripture do? Wouldn’t it be more useful to have God actually make contact, to lend a helping hand and give guidance, rather than leaving mankind to fend for itself? By the time the flood arrives, it is clear that whatever sins mankind committed to create a world this bleak, God’s sins are just as great for leaving his creations in the dark. But if that is true, is God truly divine? If the greatest moment of clarity God is willing to give mankind is the total destruction of humanity, why should we love God? Why should we believe in him? Why should we honor him, if he rejects and destroys us? Therein lies the paradox, and it vexes Aronofsky’s Noah greatly. The only way he can reconcile these many contradictions is to go on assuming God is right in all cases, and man must, therefore, be entirely in the wrong, which leads Noah to believe humanity is evil, and must be purged entirely – that his role is not to start human civilization over, but to see it put to rest forever. 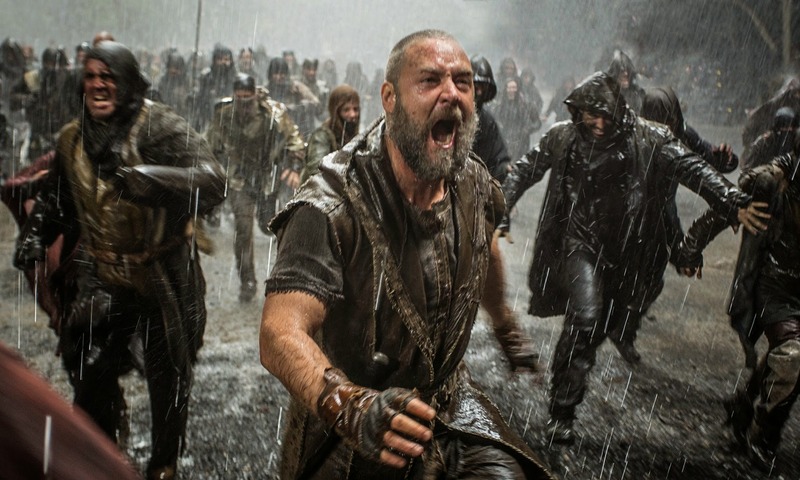 And that, to me, is the most terrifying and provocative idea in the entire film – the notion that Noah, this biblical hero we are all familiar with, would be driven by the horrors of his circumstance into absolute fatalism. It makes for an extremely dark and disturbing third-act, one that bears more than a passing similarity to Kubrick’s The Shining, but again, the drama feels absolutely earned. Aronofsky isn’t just telling the Noah story we know, but digging into its deepest implications, and in so doing, saying something profound, universal, and horrifying about how powerfully sin and guilt have always (and will always) weighed upon the human condition, and how religion has the potential to trap us in cycles of fatalism, rather than releasing us from them. And I think the film very nearly ends on a note that perfectly summarizes these many contradictions and the implications therein. There is a particular shot, about five minutes before the end, that is a perfect visual representation of the melancholy and uncertainty underpinning this story, and if I were making the film, I probably would have chosen to end it there. But that’s me – I am an atheist, and that is largely where my opinions on God stop, where my belief in his nonexistence stems from. Aronofsky wants to go further than that, to find a glimmer of optimism and hope that allows for the possibility of religious reconciliation, and I completely understand why. The choices Noah and his family make at the very end – to go on living with hope, not hatred, in their hearts – are the only ones they could make if they wanted to stay sane after all they have experienced. They must believe they can be better, if not for God then for themselves, because if not, what point is there in living? If the film’s many inquiries into the nature of mankind could be reduced to one single question, this would be it: If we as humans really are so bad, so wicked that we must be wiped clean by our creator, why live? Why breathe? Why fight on? Why not just die and go extinct and be done with it? But if one cannot do that, if one cannot live amidst such relentless despair, the only remaining option is to strive to be better. Perhaps Aronofsky’s ultimate message is that, in making this choice to try living in the light even after experiencing such immense darkness, Noah and his family – and, by extension, humanity – prove their worth to the God who abandoned them. No matter what, Aronofsky isn’t at all preaching a thoughtless acceptance of God. The film isn’t interested in blind faith, but in faith as a struggle, and in morality as something we have to separate from God, to live by for our own sake rather than for his. And in doing so, we get closer to God than if we lived in absolute dependency on him. That’s a message I can get behind, one I think the film builds to clearly and organically, even if I am not myself religious. In short, that is the power of good storytelling, and Noah is nothing if not a thoughtful, passionate deconstruction of a major human myth. And on the whole, I think the cinematic realization of that deconstruction is wonderful. The cinematography and music are, as previously mentioned, outstanding, and the special effects used to bring the flood and its destruction to life are truly awe-inspiring, an essential part of how we experience the horrific, apocalyptic scale of this story and the questions it raises. All of the film’s effects are like that, though; there is no piece of digital craft that exists purely for the sake of spectacle, and I think that is demonstrated most clearly in the realization of the Watchers, a group of – for lack of a better term – giant rock monsters who help Noah complete his task. The Watchers actually have roots in scripture, believe it or not – they come from the Book of Enoch, one of the many Hebrew texts not included in the Bible – and the concept behind them – they were Angels tasked to watch over humanity, but not intervene, and when they did so, they were bound to earth and transformed into stone – is completely in keeping with the themes of the film. Even these creatures are grappling with the boundaries of their faith, bitter towards humanity for making them disobey their God, and the CGI effects and vocal performance used to bring them to life are so effective that I found the creatures’ arcs to be genuinely, powerfully emotional. The human performances are hit and miss. 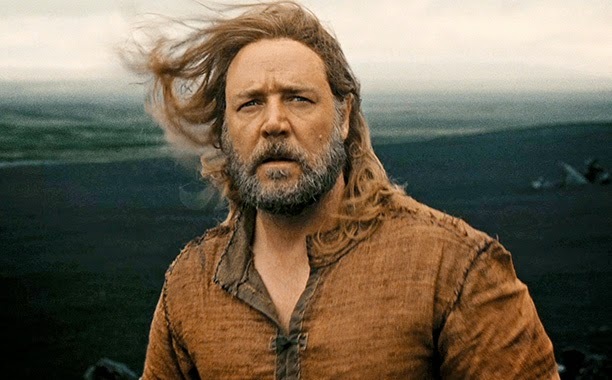 As Noah, Russell Crowe is spectacular, tackling a tough, dark part with absolute commitment and a deeply felt sense of humanity (albeit a humanity in crisis). Emma Watson also impresses as Noah’s adopted daughter, Ila; it is by far the heaviest part she’s had to date, especially considering that she is at the center of the film’s biggest philosophical inquiries, and I think she completely rises to the occasion with a passionate, vibrant performance. The rest of the cast struggles more with their parts, however, as the majority of the film’s characters are, by necessity, underwritten. Myths call for characters to be ‘types,’ broad strokes rather than intimate characterizations, and finding that proper balance is the only major aspect of the film Aronofsky seems to struggle with. The problem is most apparent with Jennifer Connelly as Noah’s wife, Naameh. She is essentially the film’s symbol for faith in humanity, the person who believes in an inherent goodness to mankind even in the darkest of hours, and that’s a tough position for Connelly to be in, because she’s basically playing an idea, not a character. She does what she can with the role, but it is an inevitably awkward performance at times, and the same goes for Logan Lerman as Noah’s son, Ham, the character who embodies the idea of temptation and the possibility of moral corruption. Ray Winstone has a meatier part as Tubal-cain, and when his character is rallying against God, it is an extremely rousing, vivid performance. But Tubal-cain unfortunately descends into cartoon villainy during the last act, and it’s another instance of the actor struggling to find depth in relatively shallow writing. But it speaks volumes to the strengths of the film’s craft, and especially to the depth and insight of Aronofsky’s interpretation of this story, that weaknesses in characterization are ultimately a minor issue. This is the exceedingly rare film where the overall scale – the atmosphere, the substance, the sweep of things – matters so much more than the individual characters. Like a Kubrick film, it is the underlying power of the movie’s philosophy and aesthetics that has impact, and while I cannot imagine every viewer will be on board with what Aronofsky has created – this is a big-budget art film, not a mainstream motion picture, and I am quite frankly flabbergasted a major studio produced and released it – those who will shall undoubtedly leave the theatre feeling deeply, irrevocably shaken. Whether one is religious or not, Noah is absolutely capable of leaving scars on the viewer, setting its intellectual hooks in so deep that one cannot shake it from one’s mind hours or days after seeing it. The film is not only religious filmmaking at its best, but narrative adaptation at its most powerful; if a story is to be retold, it should be retold in a way that offers something bold and new and provocative, and in using as familiar a myth as exists to probe deeply into some of the biggest questions we can ask as human beings, Aronofsky has crafted a true cinematic wonder.